What was the name of this project and why? 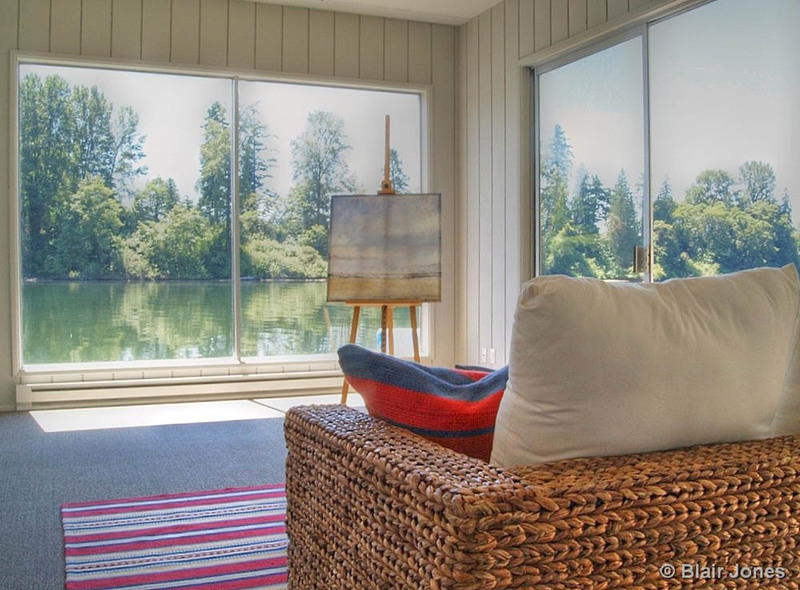 We called this home the Wilsonville Waterfront Home. 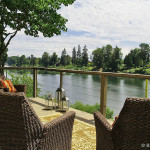 You’ll find it settled along a wooded area of the Willamette River. Demographic of the target buyer? The demographic for this buyer would be someone who is very active in water sports and outdoor activities. 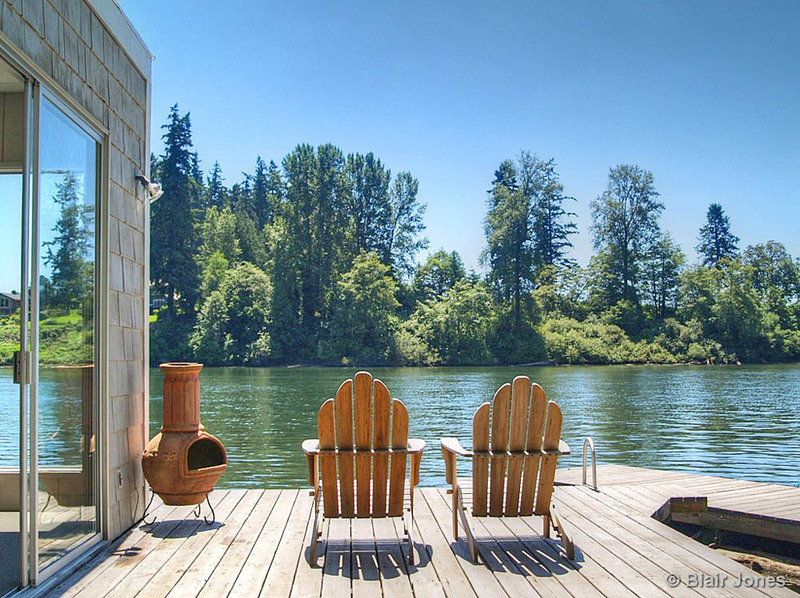 Since this waterfront home has only a Master bedroom and two other, it would likely be most suitable for a retired couple or single person. The home also has a boathouse with a sleeping area. 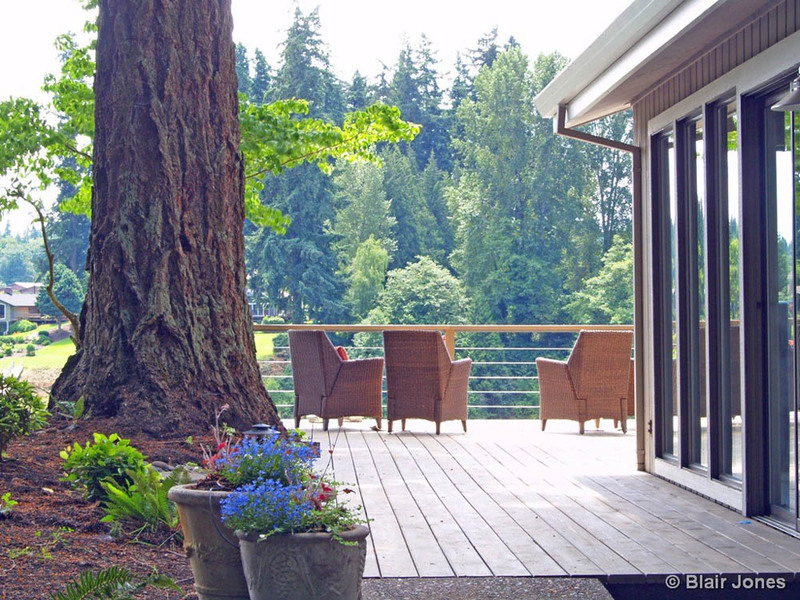 As a result, the targeted buyer may have grandchildren who would also enjoy outdoor activities. 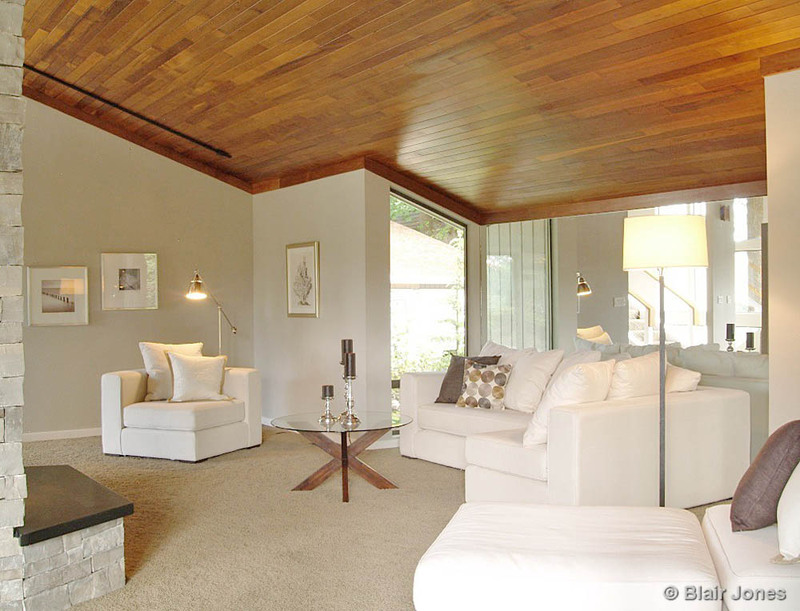 Blair Jones of Premiere Property Group hired us to provide his client with a staging proposal. Blair and I grew up together in the same neighborhood and have worked together numerous times. What challenges did you overcome? The living room layout was a challenge to stage. 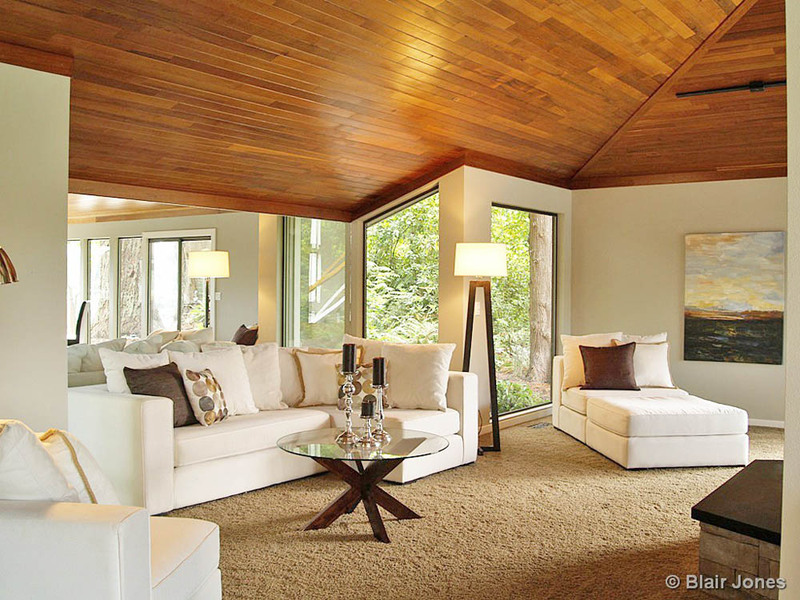 Its odd shape included a beautiful wood ceiling that sloped at an odd angle. A mirrored wall filled in the indentation where the ceiling met the floor towards the back of the room. Additionally, the fireplace blocked the view of the river. Consequently, we needed the furnishings, artwork, and accessories to reflect the view that was being blocked. 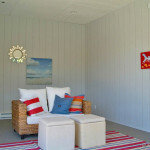 To accomplish this, we staged the room with a modular sectional and used one of the pieces as a chaise lounge. 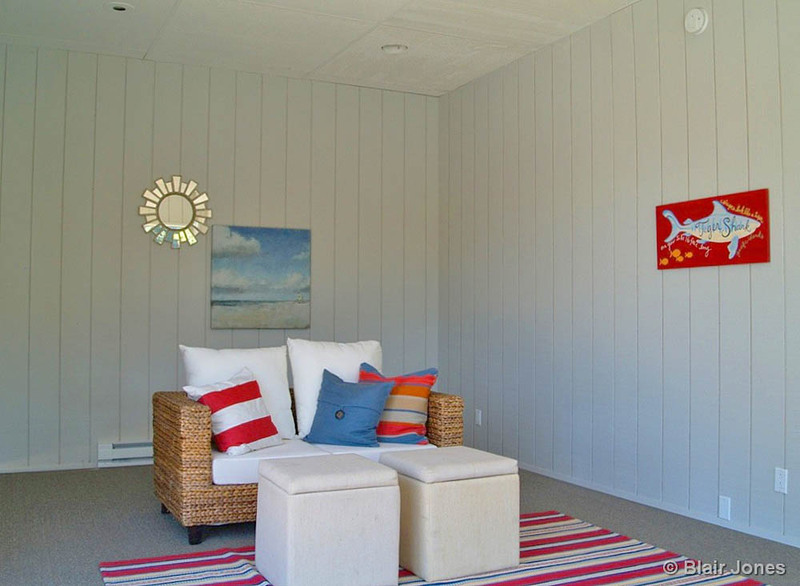 We chose artwork with water themes and colors and added a glass coffee table to make the room feel more spacious. The silver candlesticks added some reflection to broaden the space. Since the room was dark, the light-colored sectional worked perfectly with the shape of the room as well and kept the room feeling light yet cozy. What features were you focused on showcasing? This was such a fun and unique property. 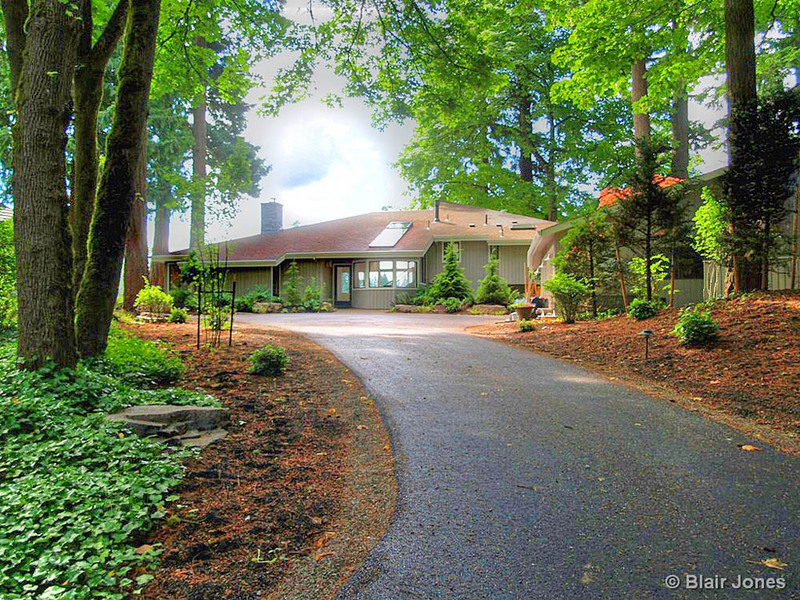 Tucked into a wooded area with a ramp leading to a dock, it had great personality. 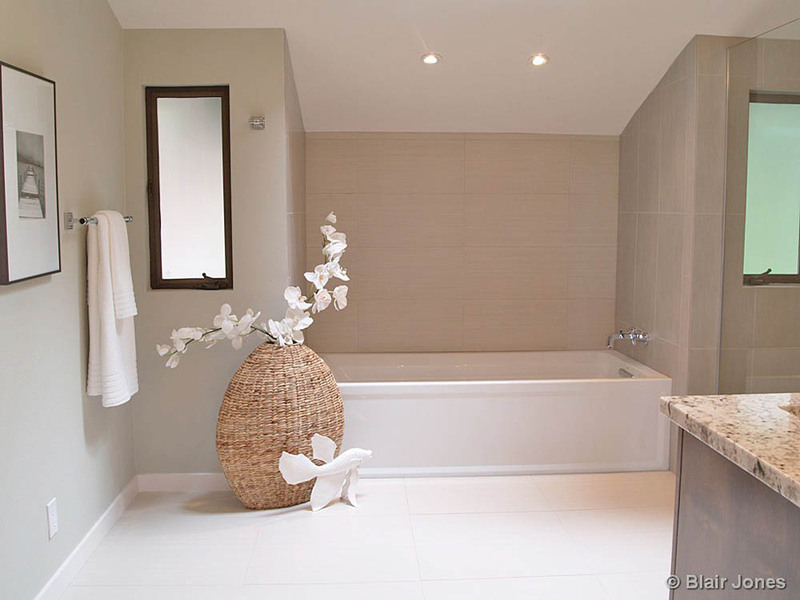 The owners had extensively remodeled the home and put some beautiful new finishes in. 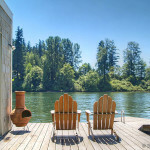 We wanted to showcase how the rooms could be used as well as to how to best enjoy the river lifestyle the home provided. 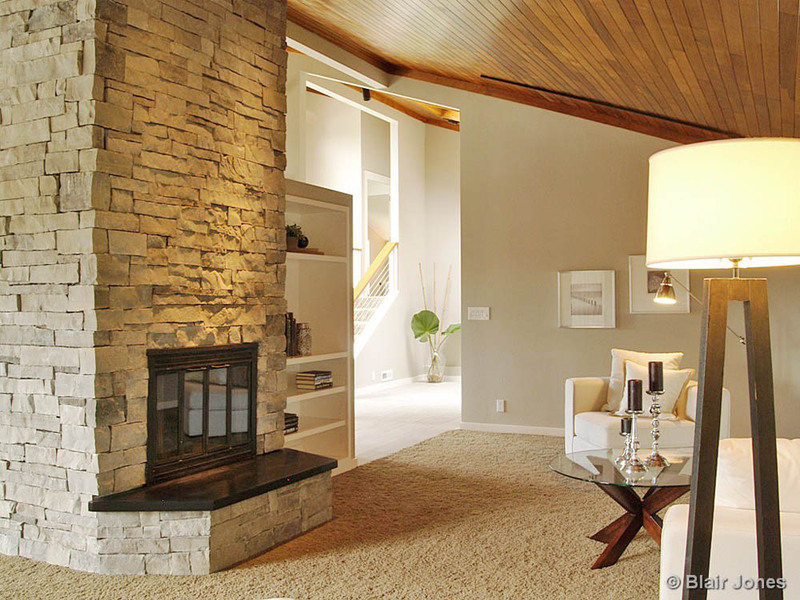 All this, while also staging the home to compliment the home’s new finishes. 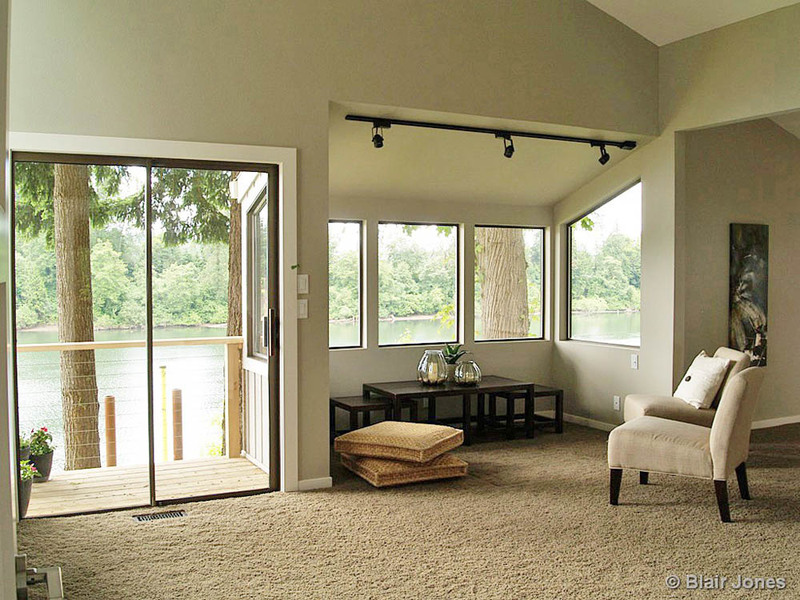 The oversized master bedroom boasted the best view of the river. 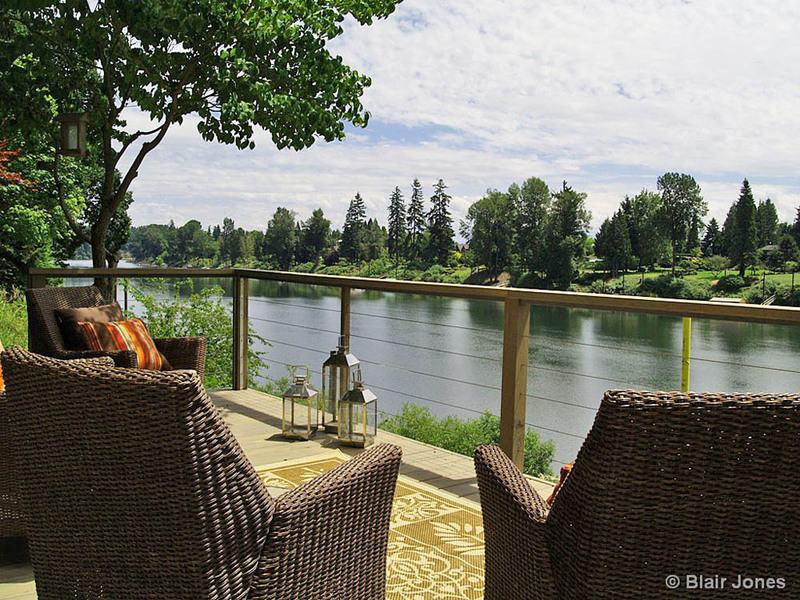 Because it was so large, we staged it with a sitting area where buyers could envision themselves enjoying the river view. We added artwork with watery colors. 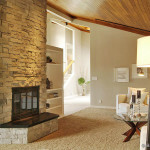 The base of the bedside lamps were even shaped as branches to reflect the wooded area surrounding the waterfront home. We really focused our efforts on staging The Boathouse as well. A small wicker loveseat with bright red and blue pillows faced the riverfront and brightened the entrance. We included an easel so buyers could also envision this area as an artist studio. The Boathouse also had two small bedrooms where guests could bunk. 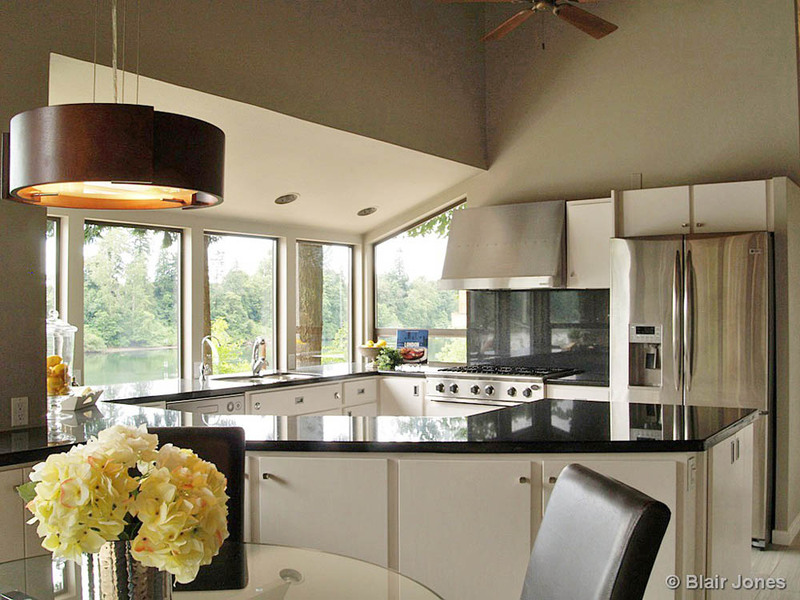 We staged this waterfront home when the housing market was in decline. Understandably, the home seller was skeptical when I quoted our average days on the market were 23 days. (The market average at that time was 6 months.) The home had an offer within 10 days and officially sold in 20 days. 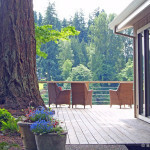 The new owners hired us to stage their former home and also hired us to design the new furnishings. 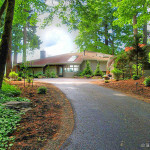 Overall, this experience provided a wonderful outcome and the sellers became our biggest fans. A few years later ended up staging another home for them, which ended up with yet another successful sale. Lenny and Lisa are amazing!!!! 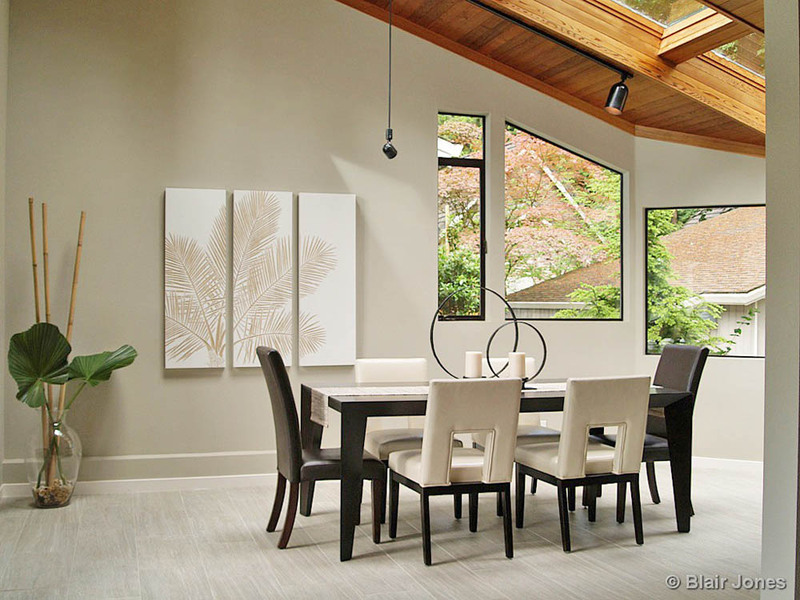 Thank you to Imagine Home Staging for creating a gorgeous space that is "picture perfect". True professionals, great to work with and have an amazing gift for design. Great people, great furniture, solid service. I've worked with Lenny and Lisa several times and haven't been disappointed yet. 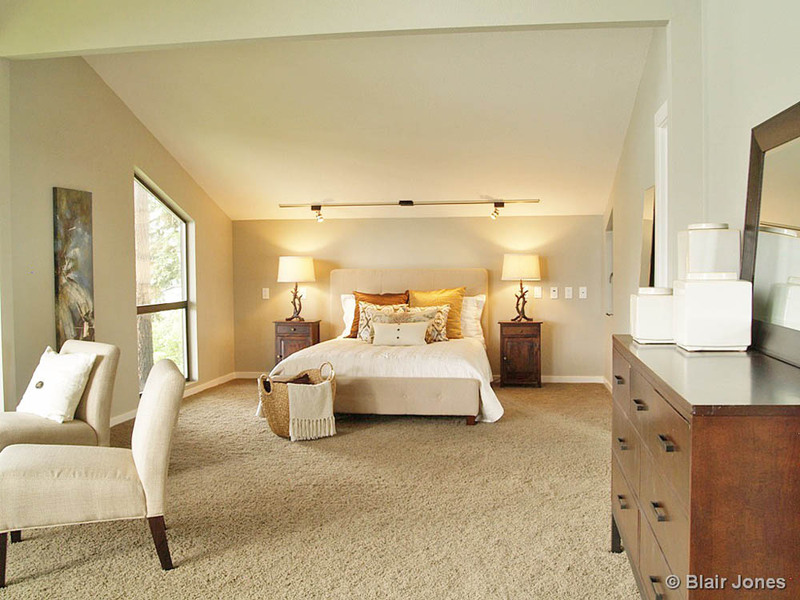 I truly believe my properties sell faster because of their staging work. Interested in our Free Pre-Listing Agent Marketing Tool? Click here!